How to Stop Emotional Eating — for Good! Are you always hungry? Or do you drown your woes in food? One of the major ‘fat habits’ that keeps people from losing weight is emotional eating. Emotional eating is common among people of all shapes and sizes—even healthy types—and it can take on different forms. You may snack at work because you’re stressed or bored, binge at night because you’re lonely, or deny yourself food because you feel rejected and unloved after a bad date. 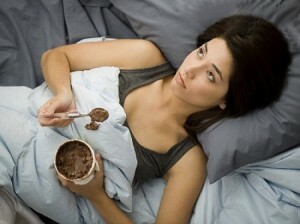 These are situations where you’re not hungry; you’re managing feelings with food. 1) Apply mindfulness to your meals. Mindfulness is a technique that allows you to be fully present in the moment, including when you eat. 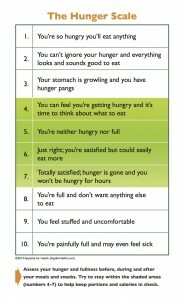 This will help you recognize when you’re truly physically hungry and when emotions are taking over. 2) Before you rush to soothe your feelings with food, stop and assess what’s happening. Observe and describe your feelings. Keeping a diary that allows you to express your emotions on paper is a common tool that is used to help overcome emotionally-driven eating. Ask yourself, “Am I really hungry”. It will help to use the Hunger Scale. If you binge on foods, using the Hunger Scale will essentially stop emotional eating as it does not come from true hunger. Try to keep your hunger controlled and within the 4-7 range on the scale. 3) Have a plan in place. When the urge to emotional eat strikes, have a plan in place to fill the void with something other than food. • Create a slideshow of pictures of friends and family (puppies?) on your iPhone or an upbeat or relaxing playlist for moments when you’re feeling stressed or sad. • If time allows, take a walk or a bath. • Also try music therapy: research shows that listening to music can reduce agitation, and photos of loved ones can replace sadness with a feeling of connectedness. If you are struggling, call a friend or supportive family member. 4) Eat! Make sure you eat a healthy breakfast, lunch and dinner every day and don’t skip meals. For more ways to break your emotional eating habit, check out our book, 101 Fat Habits & Slim Solutions. If food is your BFF, we’ll help you kick that habit — and 100 other ‘fat habits’ that may be keeping you from your ideal weight. This is definitely my nemesis. It’s a bad cycle. :( I keep trying. The critical issue here is one’s capacity for self regulation and effective self soothing. These are not innate skills. No one has to teach a child to use food to self soothe, but we do need to teach our children how to self regulate and effectively self soothe without food. Effective self soothing is a life long endeavor. The skills and tools that work in childhood need to be adapted for every other time period in our lives. Mindfulness is the first step of bridging the gap between knowledge and behavior. I am not to bad of an emotional eater, but I do find myself turning to those wonderful greasy salty treats, chips. Chips are my downfall, just love ’em. Thanks for the tips and advise..